The incorporation of a progressive jackpot on specific slots has been on of the greatest things to happen to the gaming genre in a long time. Click here to play! For those who long for the classic essence of a slot machine coupled with the chance to win several hundreds of thousands of dollars, Pay Dirt is the game for you. There are several differences to regular slots you must take into account when playing progressives. For example, you can only play with real money, and there are no minimum and maximum wagers; $1 is the set value for all bets. However, you are able to play up to 3 $1 at once due to the multiplier. 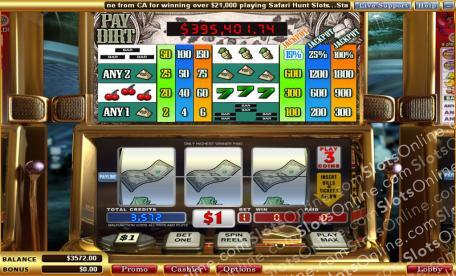 Land 3 Cash Grab symbols on a 3-coin spin and take away the entire progressive jackpot, worth over $300,000! Take yourself down to the Pay Dirt slots today and you could change your life with one single spin.